When training for a half or full marathon, it’s a given that we’ll need to work long runs into our running training program. 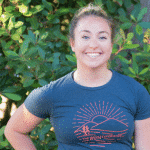 In this post, we’re going to give you a few tips on how to best utilize those long runs. We want to make sure that they train our body physically, but we also want to make sure that they train our mind so that it’s strong enough to keep us on pace when we get tired. And on a more practical level, we don’t want any surprises on race day! So long training runs are our best chance to test out all our set-up, and make sure running exactly how we like it during the race. To start, use your long runs to test out clothing. Know your temperature limits – above what degree do you prefer shorts to tights? Short sleeves to long sleeves? If you’re going with shorts, test out different liners to be sure chafing won’t be an issue on race day. Every detail matters on a long run, so make sure you know ahead of time which fabrics and fits you prefer. Another decision to make – hat, sunglasses, or both? Test out different options all at the time of day you’ll be racing so that you know what’s best. Also be sure to find a brand of sunscreen that works if you’ll be racing under the sun. When it comes to socks, take your terrain into account. Many trail racers prefer taller socks to avoid scratches on their ankles and rocks in their shoes, but that’s not necessarily for everyone. In choosing your socks’ thickness, make that decision with your race shoe in mind so that you optimize shoe fit. In choosing your shoes, maintain a balance between training in your preferred race-day shoe and preserving that shoe’s lifespan. It’s a common race mistake to train so hard in your shoes that they have nothing left to give come race day. Again, terrain will factor in here. If the course is more technical, you may want more support and therefore a sturdier shoe. If it’s a simple road course, a lightweight tempo shoe should work fine. Everyone’s mid-race food and drink preferences are different, and you can’t always rely on aid stations. To ensure you’re prepared, check ahead what food and drink will be offered by the race ahead of time, and plan ahead. You’ll also want to check how frequently there will be aid stations, so that you can pack enough sustenance for the in-between periods. With that in mind, test out different methods of storage on your long runs. 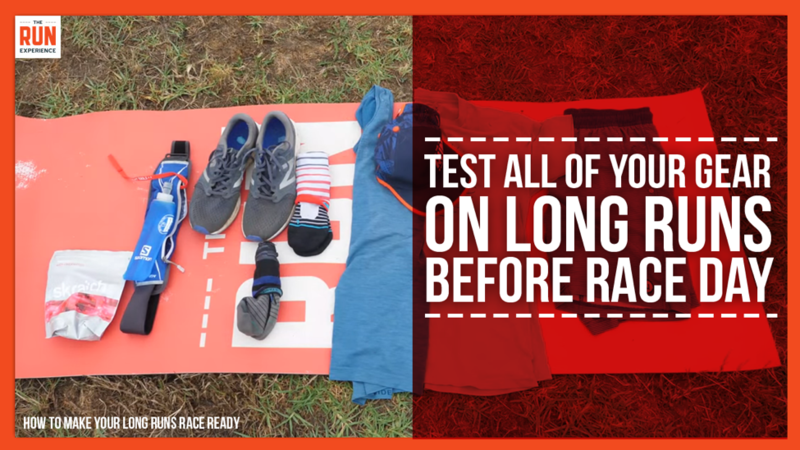 If you prefer a race belt, be sure it holds all that you’ll need on race day. Now that your gear is set up, let’s focus on the running itself. One of the best ways to make your long run race-ready is to go for a fast finish. No matter how many races you’ve done, race day will always feel different than your training runs. Try to account for this head of time by picking up the pace at the end of your long run, for at least the last mile if not sooner. 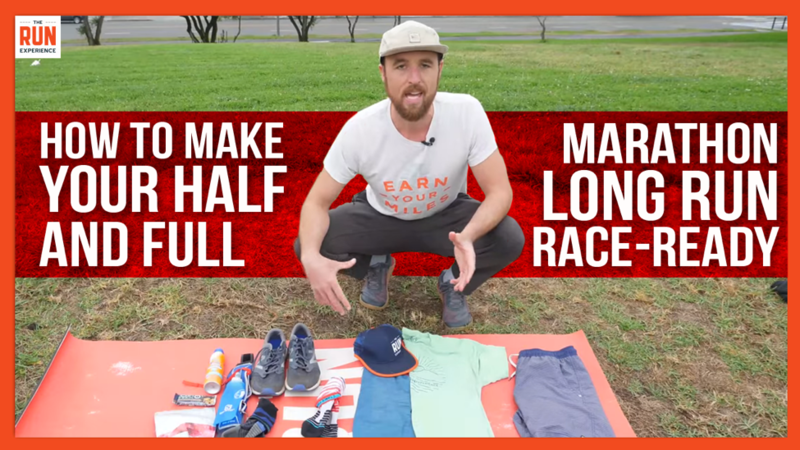 If you are new to racing, don’t worry about having a “race pace” nailed down yet. Simply aim to run faster for the last mile or two. This allows your body to learn what it feels like to push through fatigue and crank it up for a strong finish. You may not see dramatic results on the clock here, but it’s great practice for your body to understand what will be asked of it come race day. Think of this as a mini running speed workout within a longer effort. If you are more advanced, know that you will be running 60 to 90 seconds per mile slower than your race pace heading into the last couple of miles. 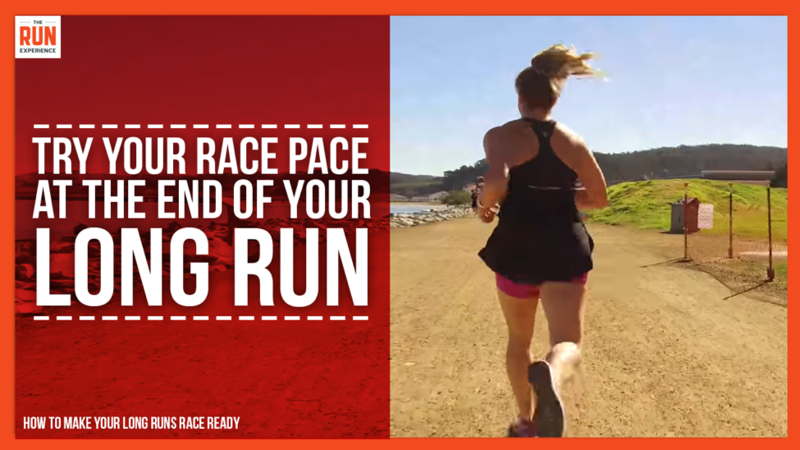 Use your long runs to see what your race pace actually feels like. Push yourself to hit that pace, but also use these runs to ensure your race pace is realistic. We are using this strategy to teach our body how to improve running endurance. Be sure you can eat and drink at race pace, and that it’s sustainable for however long you have left in your run. Over time this training strategy will train you to be more conservative at the beginning of your run, because you’ll know what it takes to hit that race pace late in the race, when you need to hit it the most. This tip is crucial in avoiding the “marathon shuffle”, A.K.A. that point in your race where run form goes out the window, and you’re just trying to stay in motion as you move to the finish. On your long runs, incorporate some running drills every 30 minutes. Our favorites at The Run Experience are a lateral shuffle and carioca, because they keep you moving while waking up new muscles. These drills will get your hamstrings and glutes re-engaged, so that those muscles can fire up when you return to running. And when your glutes and hamstrings are working, proper run form comes more naturally to your body. This will help to prevent injuries, and to keep pace towards the end by allowing your muscles to feel fresh. If you’ve been wondering how to improve running speed, often times all you need is to reawaken your muscles to find that pace you’re seeking. Your long runs are your test runs, so use them as such. Test out different clothes, food, paces, and drills until you find exactly what works for you, and exactly how much your body is capable of. That way, when you hit those tough patches of the race, you’ll be used to it and you’ll have a gameplan.